It’s likely that any new tablet computer will be compared to an iPad. The Acer Iconia Tab W500 is no exception. Because this tablet runs a full version of Windows 7, it is a much more appropriate teaching tool for a classroom teacher. Running Flash and all of the familiar desktop applications, teachers and students can get a familiar computing experience and yet have the tablet feel. The Iconia W500 also adds the tablet interface with all of the gestures common to tablet technology. The product’s touch screen is better than most, yet not quite as responsive as an iPad. The major downside of this device is the lack of a stylus or digital pen. Windows 7 offers incredible “inking” technology and is very responsive to handwriting recognition, all of which is lost when you go from a pen to a finger. 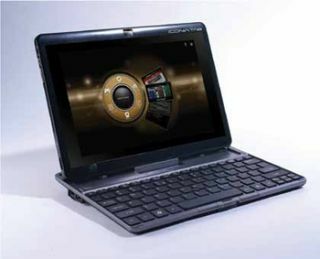 • For the price of other popular tablets running a mobile operating system, you gain a full operating system, a keyboard, and an “eraser tip” two-button mouse. This allows for easy creation of content as well as consumption. • The device is relatively light, intuitive, and responsive to natural gestures. • The ability to run Flash gives the classroom teacher access to the full range of materials on the Web.